Perfect for families, beach holidays and golf breaks, self-catering, sleeps 4. 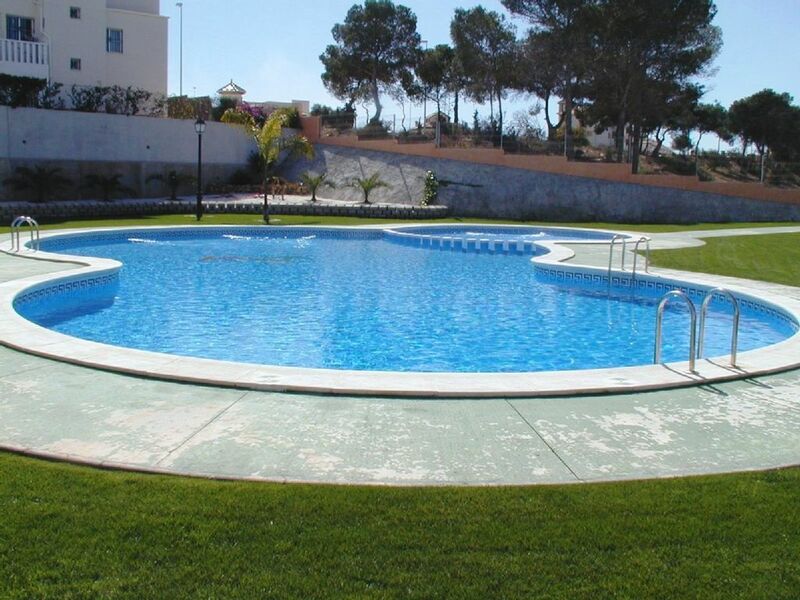 This deluxe 2 bedroom, top floor, air-conditioned apartment is situated on a quiet development in a prime location between the Lomas de Cabo Roig and Campoamor on the Costa Blanca. The apartment is self-catering and is furnished to the highest standard, has a fully equipped kitchen and the bright and airy double and twin bedrooms both have fitted wardrobes with ample hanging space. The open plan lounge/dining room includes two settees one of which converts to a double bed to accommodate a further two guests if required, a dining table that seats 6. The apartment also has satellite TV, a DVD player Wi-Fi access and ceiling fans in both bedrooms. The bathroom has a bath, shower, washbasin, toilet and bidet. Bed linen and towels (with the exception of beach/pool towels) are provided for your use. The balcony has sea views and is an ideal place to enjoy breakfast or an early evening cocktail. The apartment also has a large private roof top terrace for sun worshippers, al-fresco dining or a Bar-B-Q. The resident's private swimming pool has both adults and kiddie’s pools, a play area and landscaped gardens. The area.....: As well as the magnificent beaches, water sports, bars and restaurants, shopping and golf, the area also has a wide range of other attractions. Within easy driving there is the tranquil city of Elche with its palm lined streets and a botanical garden, Orihuela, once the capital of the region, is an ancient city with narrow streets and a bustling market, the old port of Cartagena has beautiful architecture and its Cathedral should not be missed nor should Murcia's Cathedral of Santa Maria which is one of the finest baroque buildings in Spain. Apart from the Mar Menor which is Europe's only lagoon there are also three nature reserves and two inland salt water lagoons which are ideal for walking and a paradise for bird watchers. The regional park at Calblanque has a gorgeous stretch of unspoilt coastline and is one of the Costa Blanca's best kept secrets. For those who enjoy Spanish wine the towns of Jumilla and Yecla produce fine red wines and many bodegas offer tastings and tours. Costa Blanca Weather: The Costa Blanca has year round sunshine with mild Winters, hot Summers with pleasant temperatures in Autumn and Spring when the area is at its lushest. Average monthly temperatures range from 11°C in January to 27°C in July; sea temperatures from 14°C to 25°C and the average hours of sun per day from 6 to 12. There are three golf courses within 5 minutes drive of the apartment and many more in the area. The two bedrooms have double fitted wardrobes, chests of drawers and a baby cot. In addition there is a double bed settee in the lounge. The apartment is situated on the second floor and as there are no lifts wheelchair access is not possible. Arrival time is from 15:00 and departure no later than 11:00. Our local agent will meet you at the apartment to hand over the keys. For arrivals between 21:00 and 09:00 there will be an out of hours charge of E25 payable directly to the agent on arrival. Hi Rob, So glad you enjoyed your holiday and thanks for your generous review which is much appreciated. Spotless, well maintained holiday home. This very tastefully decorated home has everything needed for your holiday. Flat screen tv with English satellite channels and DVD player. There is a good collection of DVD's and books. Kitchen has everything you need. Enjoyed a good few BBQ's up on the roof top. You need a car as it is in a quiet urban location but that is what we wanted for a young family holiday. The location is minutes away from a supermarket and the pool which was nice and quiet is only 4 minute walk and is locked with a gate to keep private to guest homes in the surrounding streets. Concernant la maison louée, c'était super, une maison bien équipé avec une belle vue et calme. Même le propriétaire a chaque fois on avait un problème il etait toujours a l écoute et serviable. The local shopping centre is just a few minutes walk from the apartment with a supermarket, shops, restaurants, bars and internet café. The area offers excellent shopping, a weekly market and many cafes, bars, restaurants and a vibrant nightlife. For the children there is a waterpark at Aquopolis with its river rapids and kamikaze slides, a theme park at Terra Mitica a fairground, safari park and a number of go-karting track. There are three superb par 72 courses less than 5 minutes drive away so it is an ideal base for golfers. Golf: With its year-round sunshine and mild temperatures the Costa Blanca is one of the top golfing destinations in Europe which makes the apartment an ideal base for the golfer. There are three superb par 72 courses less than 5 minutes drive away. Real Club de Golf Campoamor has expansive fairways, lush greens and is the most panoramic. It is built on a former country estate and surrounded by beautiful unspoilt countryside, the course features a beautiful range of colourful and scented pines, palm trees, cypresses, olive trees and roses which further enhance the stunning Mediterranean views. Las Ramblas is an undulating and challenging course in a dramatic, contrasting landscape. One minute you're trying to steer clear of trees and shrubbery and the next you're trying to avoid rocky outcrops. Be warned it's a battle you might well lose but you'll love trying. Villamartin is a beautiful course with undulating fairways with well protected greens which need careful reading. There are over 20 courses within an hours drive including La Finca, La Torre, El Valle, Hacienda del Alamo and of course La Manga with its three championship courses. Discounted green fees are available for groups/societies/small parties/individuals from The Golf Factory which is just down the road. Bookings can be made either in-store or on their website. There is an additional £62 (70 Euros) charge to cover cleaning and washing on departure and a refundable deposit of £125 (140 Euros) to cover any damages/breakages during your stay. These fees will be taken by our local agent on arrival. Rates are subject to change until your reservation is confirmed.